Kyle Masur (L) and Ron Nguyen take aim at flying Asian carp with a bow and arrow during an expedition with Peoria Carp Hunters on the Illinois River in Peoria, Illinois. Asian silver carp jump as high as 10 feet in the air when spooked by a boat motor or other disturbances in the water. Shooting a fish flying through the air with a bow and arrow isn't as hard as you would think. At least, not when it's a 20-pound Asian carp -- and there are so many the one you got wasn't necessarily the one you targeted. "That's what I like to see!" cried captain Nathan Wallick as he steered his boat into a school of carp so big the Illinois River was bubbling. "Popcorn!" The carp from Asia -- an increasing problem in these Midwestern US waters -- are nervous creatures and get spooked by the sound of a boat motor. Add an aluminum hull to intensify the vibrations and they turn downright suicidal. 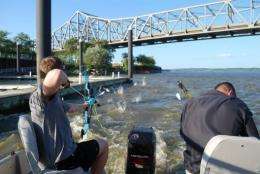 Corpses of fish that leapt out of the water and couldn't flop back in litter the public dock in downtown Peoria where Wallick picks up clients for a day of bow fishing, a sport that uses special archery equipment. Even the volleyball nets Wallick set up around the edge of his boat aren't enough to keep his deck clean. Carp fly over the unprotected space around the motor or slide under the narrow gap at the bottom. Some particularly athletic chump make it clear over the net. 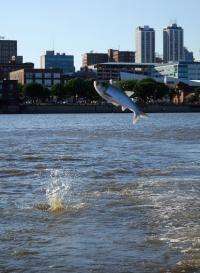 Asian silver carp jump as high as 10 feet in the air when spooked by a boat motor or other disturbances in the water. The fast-breeding and voracious fish -- often called aquatic vacuum cleaners -- have wiped out native species and put a major dent in recreational fishing and boating on lakes and rivers across the central United States. Fish after slippery silver fish, Wallick picks them up, and tells his customers to take aim. "Pull!" he shouted as he tossed the wriggling fish into the air. Bryan York missed that shot, but a few minutes later a cheer went up as he struck silver and reeled it in. "I feel deadly," he laughed as he shook the still struggling specimen off his arrow and into a tin garbage bin. "It's awesome," said his buddy Ron Nguyen, shoulder covered in slime after he got smacked by a fish that made it over the net. He was shocked that the "carp hunting" videos they'd watched online weren't exaggerating. "I wouldn't believe it unless I saw it," he told AFP. 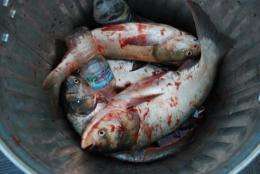 Asian carp were originally imported to the southern United States in the 1970s to help keep retention ponds clean at fish farms and waste water treatment plants. Heavy flooding helped them escape en masse into the Mississippi River system in the early 1990's and they have since spread across much of the central United States. The fast-breeding and voracious fish -- often called aquatic vacuum cleaners -- have wiped out native species and put a major dent in recreational fishing and boating on the lakes and rivers they invade. While Wallick and his customers may have a good laugh, most people aren't willing to set up protective nets or risk bruises and even broken bones for a day out on the water. Fast-breeding and voracious Asian carp -- often called aquatic vacuum cleaners -- have wiped out native species and put a major dent in recreational fishing and boating on lakes and rivers across the central United States. Despite massive efforts to stop their spread -- including electric fences installed upriver near Chicago -- there's growing evidence that carp have made it into Lake Michigan. Which means the entire Great Lakes system along the US-Canadian border -- and a seven billion-dollar sport and commercial fishery industry -- is at risk. Wallick is no fan of carp. He shakes his head at the slime they spread all over his swank boat, so disgusted he doesn't know how customers can eat after an outing at Joe's Crab Shack, a dockside fish joint that does not serve carp. While considered a delicacy in Asia, most Americans do not want to eat carp. Too bony. Too bland. Local governments are trying to change that by renaming carp 'silverfin' or 'Kentucky tuna' and enlisting top chefs to come up with recipes suitable to an American palate. There's even been talk of feeding it to inmates and canning carp to hand out at food banks instead of pricier tuna. Wallick -- a firefighter who started up Peoria Carp Hunters as a side business last summer after years of taking his friends out -- simply dumps the day's catch for the coyotes that hunt near his home. And while he won't eat them, he sure enjoys shooting them. "I describe it to people as bowfishing on steroids," he said. "It's non-stop participation, non-stop activity. The only break they get is when their arm gets too sore to pull back and they have to switch out and give it to the next person." ... there's growing evidence that carp have made it into Lake Michigan. Every few years, yet another exotic invades the Great Lakes. Last I remember was the zebra mussel. Which is another vacuum cleaner. The lakes might end up being the cleanest water on earth.